This entry was posted on January 23, 2012 by Russell Smith. It was filed under Street, Urban and was tagged with advertising, California, Hollywood, Russell Smith, sign spinner. love this dog boy!! i’d like to apply some of my photography 101 critiquing skills. this photo portends a bleak near future for the housing market. 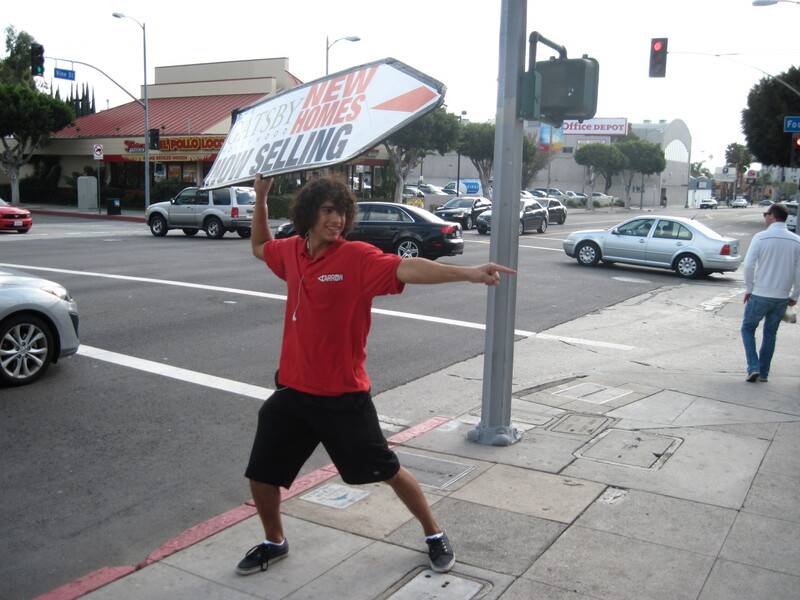 while the young man promises new homes with his best dance move, consumers are moving the opposite direction. even the only other pedestrian refuses to acknowledge the shining new homes. another layer of meaning is the ambiguous race of the jester. considering people of color were some of the biggest losers in the collapsed housing market because of unscrupulous banks and realtors, his participation seems well… unsavory. ok, i know this kid just needed a job. please let me justify the thousands i still owe for my art education. Thank you, Earl. You rule.